The Advance 86, produced by a small British company with big Ferranti connections, had the backing of high-street retailer WH Smith, which had picked it over the Sinclair QL as its choice for the burgeoning IBM-compatible budget business market, in a deal worth £2 million. The rejection of the QL, which had only been available since April but was already being viewed with the Hairy Eyeball thanks to its non-standard Microdrives, non-standard and unfinished OS and long delivery delays, was interesting as WH Smith had done particularly well out of Sinclair's ZX81 and Spectrum models, the Sinclair machines having significantly contributed to helping Smiths sell £28 million-worth of computers in 1983 (about £90 million in 2019). It probably didn't comfort Sinclair much, but the Advance deal also meant that WH Smith also dropped Apple's IIe from its roster. The IIe, a version of the Apple II first sold in 1977, had just seen its price dropped from £951.75 to £684.50 (£2,200 in 2019), on the back of the introduction of yet another version of the same machine - the Apple IIc. 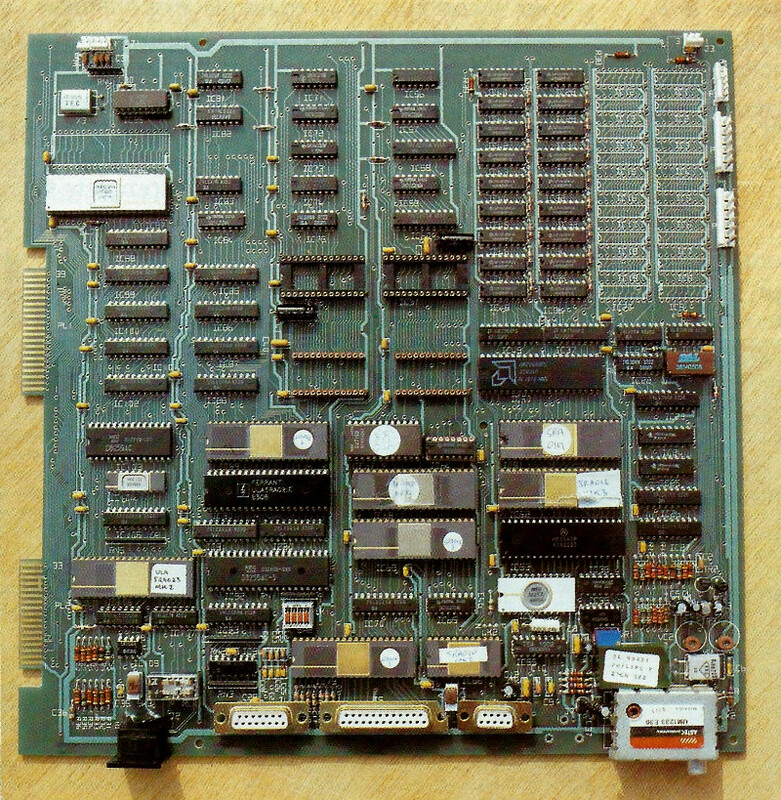 The motherboard and CPU of an Advance 86a, © Practical Computing, October 1983Designed by Advance Technology UK, and built by Ferranti - the company that also made Sinclair and Acorn's "uncommitted logic array" chips, including those which were at least partly blamed for the lateness of the BBC Micro, the Advance 86a was a fully-fledged 16-bit micro aimed both at the home (it still provided a cassette port) and the IBM-compatible business market (with the addition of a floppy disk unit). "IBM compatible" in the 1970s had always meant being able to work with the mainframe 3740 disk standard, but now it meant anything that worked in the same way and ran the same software as the 5150 IBM PC, or its later variants - the AT and the XT. The Advance 86a, as well as being one of the more-compatible of the IBM "clones", actually had one up on the IBM in that it was a true 16-bit system - the IBM ran an Intel 8088 which was 16-bit internally, but only had an 8-bit data bus, making it slower than the 16/16 Intel 8086 of the 86a - the latter running some 40% faster. Advance Technology, the company, was unusual in that it was set up solely for the purpose of selling the Advance 86, which had taken a year and a half to get to market. The company consisted of three employees plus MD Jack Dangoor, who had been in the electronic watch business for the previous eight years. He said of the move into micros that "Everybody thought I was absolutely loony when I said I was going to make an IBM look-alike, faster than the IBM with an enormous amount of memory - for the same price as the BBC [micro]". He continued "At least 90% of sales will be abroad. Already sole distributors are being appointed on a country-by-country basis". The business model for Advance was that once an order was received it was passed on to one of four manufacturers to produce and deliver, of which there were three in the UK and one in Japan, where there was already a distributor in place. Dangoor compared other UK computer companies to electronic watch manufacturers who would "make a watch for £100, and then gradually reduce to £95, £90, slowly, slowly, slowly. Then there are the other people; they bought out a watch for £10 and kept it at £10. And in the end they were the ones that won out". One of the most-quoted yardsticks of true IBM compatibility, as even quoted by Bill Gates himeself, was whether the machine would run Microsoft's Flight Simulator, already established as one of the most popular PC games but also known for pushing a machine to its limits. Luckily for the Advance, Gates was actually working with the company to make sure that MS-DOS ran properly on the system. The 16-bit 8086 processor itself had been around for over four years at this point, having been available in the UK from around January 1980 as a plug-in board for older S100 systems. This had been imported by U-Microcomputers from Seattle Computer Products. Seattle Computer Products had written an operating system to go with this board (it was one of many based on sometimes-incomplete clones of Gary Kildall's CP/M) which was later acquired by Microsoft and turned in to PC-DOS for IBM, which they also sold directly as MS-DOS. 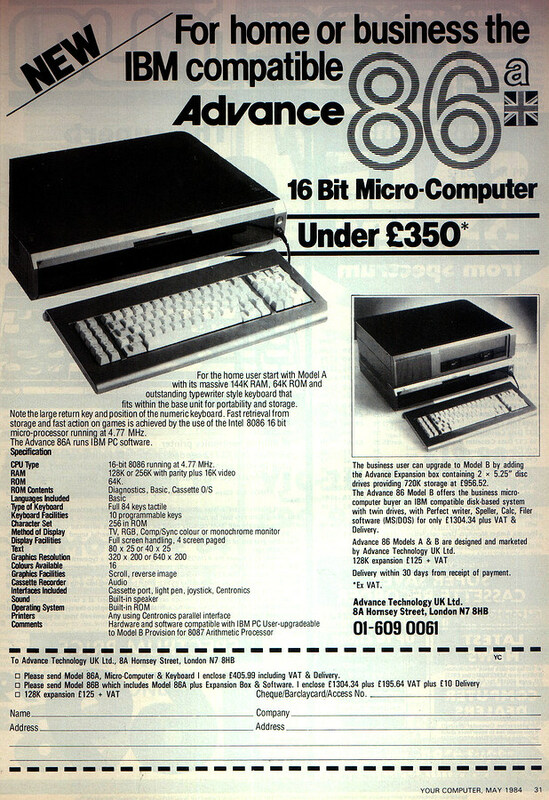 The Advance was also cheaper then the IBM, with the home-computer-market-focussed 86a available at £405.99 (about £1,300 in 2019) and the business-oriented 86b, with twin-drive floppies and a bunch of free software for £1,500 (£4,820) - in 1982 the IBM was retailing for around £2,700 (£8,680). It reviewed well, with Personal Computer News concluding that "It is a very good deal. You would be hard pressed to find a similarly-equipped, fully IBM-compatible PC for a better price. So, if you want an IBM-compatible desk-top micro and don't mind it being big, black and bulky, this is probably the machine to get. It was however late, with Personal Computer News pointing out that it had still not appeared by September 1983 despite being due out in June/July of that year. 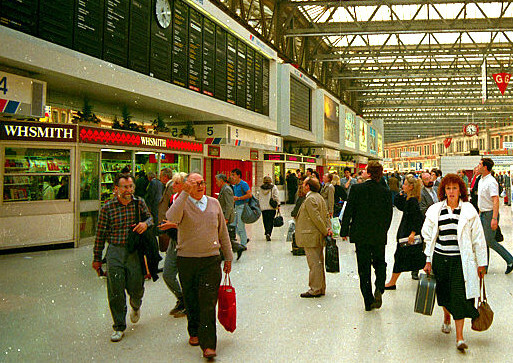 WH Smith at Waterloo Station, September 1987The Advance became the target of legal action from IBM at the end of 1984, after Big Blue had "rigorously examined the [BIOS] routines and found that they are 90% identical with our own. Even the known errors in the BIOS have been reproduced identically". Ferranti responded by suggesting that a new version of the BIOS was being made available only three weeks later, which was a highly ambitious delivery target. Ferranti also announced that it was taking over distribution of the Advance in the light of IBM's move, in order to soothe nervous dealers who were clearly worried about the impending legal action. Retailer WH Smith was caught up in the action too, as it was selling the Advance at its new Waterloo Station Computer Shop, opened just a week after IBM's nasty-gram telling both firms to "stop it". Overall, WH Smith's selling of the Advance didn't seem to go too well, considering comments about WH Smith's and others' "track record of trying to sell business machines".